Nestled on 12 acres in the Bel-Air Estates neighborhood of Los Angeles, the iconic Hotel Bel-Air is one of the most beautiful, romantic, and exclusive hotels in the world. Just opened after a two year transformation, this Spanish mission-style urban oasis wins a never-ending stream of praise for its faultless service, luxurious accommodations, and magical ambiance. 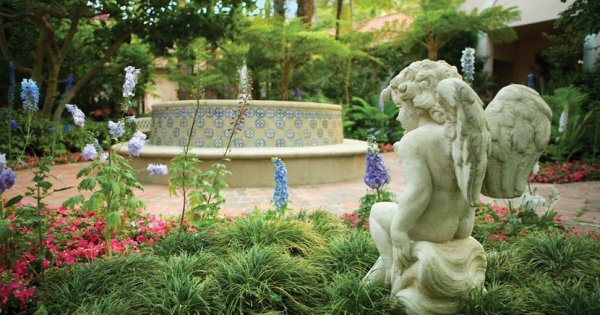 Hotel Bel-Air’s 12 acres of gardens have created a peaceful environment for health and wellness for over 65 years. 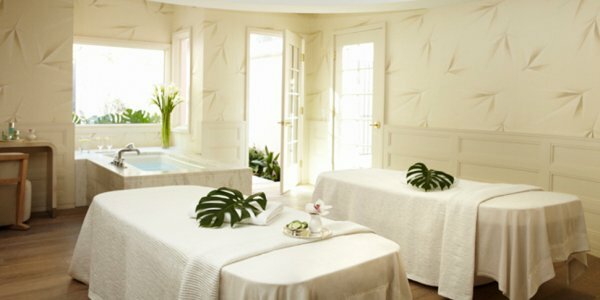 We are very excited to launch the next enhancement to our magical oasis, the new Hotel Bel-Air Spa by La Prairie. The new spa features seven treatment rooms, including a couples enclave with private patio, a mosaic steam, and comfortably chic relaxation areas. 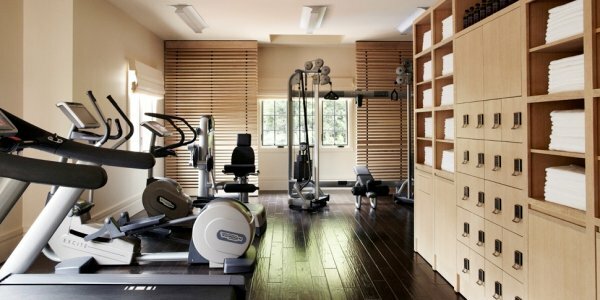 A new state-of-the-art fitness studio is adjacent to the spa. Accessible 24 hours via key card our new fitness studio is located upstairs in the new La Prairie Spa building. A selection of state-of-the-art Technogym equipment will keep you entertained with USB ports, internet access and TV’s on all cardio machines. Free weights, stretching area and chilled lemon water will make you feel even more refreshed. For over 65 years, the signature oval-shaped pool has been the focal point of Hotel Bel-Air. Surrounded by hanging palms and cascading blooms, the hotel’s unique oval-shaped swimming pool is heated to 82 degrees for year round enjoyment. As the temperature rises, guests are refreshed with hourly complimentary amenities like our farmers market fruit “push up pops,” chocolate dipped frozen banana medallions and cucumber scented chilled face cloths. Luxurious skin care products are also available to our guests courtesy of Hotel Bel-Air Spa by La Prairie including sunscreen lotion & soothing tonic. Poolside cuisine presented by Wolfgang Puck at Hotel Bel-Air. Breakfast, Lunch, snacks and an array of specialty cocktails may also be enjoyed in this ideal setting. Open daily from 8:00am to 8:00pm. Hotel Bel-Air offers a unique and private location for high-profile executives who wish to avoid the typical hotel business setting. Now paired with the legendary cuisine of Master Chef Wolfgang Puck, Hotel Bel-Air brings a new level of innovation and inspiration to your special event. 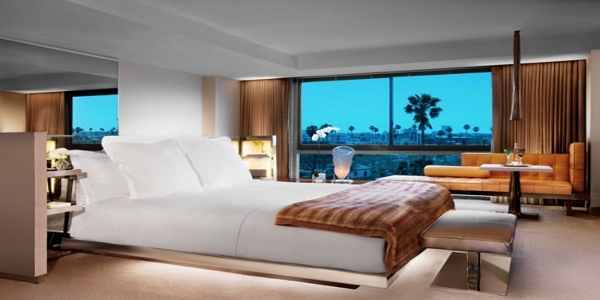 Minutes from Beverly Hills and Century City, and within easy access to the freeway, Hotel Bel-Air offers executives a unique alternative to the noise and commotion of larger chain hotels. The privacy and exclusivity of the hotel provides ideal surroundings for confidential business transactions. Immediately upon crossing over the canopied bridge, the distractions and hassles of the typical city hotel are left behind. The luxurious grounds and quiet pathways of Hotel Bel-Air create an intimate and peaceful environment for business. Wolfgang Puck at Hotel Bel-Air sets the culinary standard for providing award-winning restaurant-quality cuisine, flawless service and creative flair, perfectly matched to your meeting or special event. Best known for catering such high-profile events as the Oscars Governors Ball, Emmy’s, and GRAMMY Awards star-studded after parties, Wolfgang Puck will create a truly memorable experience for you and your guests. 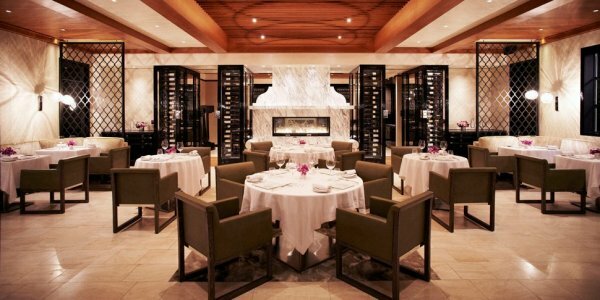 View the LA TIMES REVIEW of Wolfgang Puck at Hotel Bel-Air for more information. The lush gardens of the property create an ideal backdrop for a culinary journey through modern California cuisine with quintessential influences from Spain, France and Italy. Our chefs visit the farmers market each week to find the freshest, most seasonal ingredients and will work with you personally to develop a bespoke experience. In January 2012 a wonderful couple, Abbey and Grant, were one of the first to get married at the newly re-opened Hotel Bel-Air. We’d like to thank them for allowing us to share this beautiful video of their very special day. Hotel Bel-Air’s world-renowned gardens and recently transformed facilities have been the backdrop for creating lifetime memories for more than 65 years. Now paired with the legendary cuisine of Master Chef Wolfgang Puck, Hotel Bel-Air brings a new level of innovation and inspiration to your special event. The hotel’s secluded setting on Stone Canyon Road just minutes from Beverly Hills, and its glorious gardens that bloom all year-round, can accommodate intimate gatherings of ten or larger events up to 300 guests. Reputed as one of the most romantic areas of the grounds, Hotel Bel-Air’s Swan Lake is the most famous setting for romantic day and evening weddings. The scene of many spectacular weddings throughout its history, the verdant, spacious lawn features a towering 100 year-old Sycamore tree and live swans within the jewel-like lake. The lush gardens of the property create an ideal backdrop for a culinary journey through modern California cuisine with quintessential influences from Spain, France and Italy. Our chefs visit the farmers market each week to find the freshest, most seasonal ingredients and will work with you personally to develop your bespoke dream menu. The redesign of Hotel Bel Air is inspired by 1930s, 1940s and 1950s Hollywood, a period of Southern Californian residential architecture and design that produced an all American style evoking glamour and graceful living with international flair. 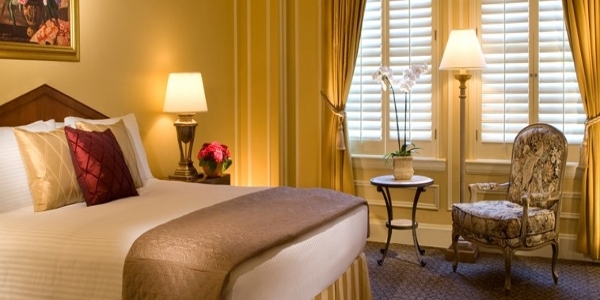 Deluxe guestrooms are located throughout the property and feature individual entrances from the gardens. Many Deluxe Guestrooms connect to Garden Suites with Patios or other Deluxe Guestrooms. Deluxe guestrooms with patios are located throughout the property and feature individual entrances from the gardens. French doors leading to lush garden patios with comfy seating areas complete the idyllic atmosphere. Some Deluxe with patios have the option to connect to other Deluxe with patios, Grand Deluxe guestrooms, Garden Suites with patios or as second bedrooms to the Grace Kelly or Presidential Suite. Grand Deluxe guestrooms are located throughout the property and feature individual entrances from the gardens and wood burning fireplaces. French doors leading to lush garden patios with comfy seating areas complete the idyllic atmosphere. 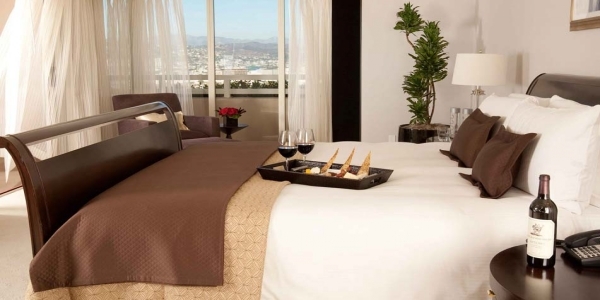 Some Grand Deluxe guestrooms have the option to connect to Deluxe with patios, or Grand Deluxe guestrooms. Accessible Guestrooms are located throughout the property and feature individual entrances from the gardens. French doors leading to lush garden patios with comfy seating areas complete the idyllic atmosphere. Loft guestrooms are located in the new spa building in the Upper Canyon and are our most unique accommodations. These three guestrooms were designed with an open floorplan, Loft Guestrooms feature a balcony, 13.5 foot ceilings and retractable doors from the bathroom opening up the entire space. A two-sided gas fireplace at the center of the space is visible from the sofa, bedroom as well as the bathroom. Loft Guestrooms are a truly unique and contemporary space. Canyon Guestrooms are located on the hillside in the Lower Canyon and are our newest accommodations. Each of these unique spaces blend the indoor and outdoor elements effortlessly with retractable walls opening up to a large private patio with comfy seating areas, fireplace and spa pool. Most have the option to connect to other Canyon Guestrooms or Suites. Premier Canyon Guestrooms are located on the higher levels of the hillside and are our newest accommodations. Each of these unique spaces blends the indoor and outdoor elements effortlessly with retractable walls opening up to a large private patio with canyon views, comfy seating areas, fireplace and spa pool. Most have the option to connect to other Canyon guestrooms or Canyon Suites. Junior Suites are located throughout the property and feature individual entrances from the gardens. Each Junior Suite features a seating area, some with wood burning fireplaces and garden patios. Bel-Air Suites are located throughout the property among the glorious gardens. Featuring an elegant living room, master bedroom and bath, and some feature wood burning fireplaces. These beautiful suites were designed to bring the outside in. Bel-Air Suites with Patios are located throughout the property among the glorious gardens. Featuring an elegant living room, master bedroom and bath, and a garden patio with seating area these beautiful suites were designed to bring the outside in. Many Bel-Air Suite with Patios also connect to Deluxe Guestrooms to accommodate larger families. Canyon Suites are located on the hillside in the Lower Canyon and are our newest accommodations. Each of these unique spaces blend the indoor and outdoor elements effortlessly with retractable walls opening up to a large private patio with comfy seating areas, fireplace and spa pool. Most have the option to connect to other Canyon guestrooms or Canyon suites. Premier Canyon Suites are located on the higher levels of the hillside and are our newest accommodations. Each of these unique spaces blends the indoor and outdoor elements effortlessly with retractable walls opening up to a large private patio with canyon views, comfy seating areas, fireplace and spa pool. Most have the option to connect to other Canyon suites or guestrooms. Located in the Lower Canyon area on the second floor, the Two Bedroom Bel-Air Suite features an elegant living room with French windows, master bedroom and bath, as well as second bedroom. The Grand Suite is located in the Middle Canyon and features a Spanish modern design theme. An elegant living room with gas fireplace features French doors leading to a 410ft² garden patio with seating area. The new Patio Suite is one-of-a-kind and evokes contemporary simplicity. Featuring one bedroom and one in a half baths this suite is located near the Grace Kelly Suite in the Lower Canyon and includes an elegant living room with French doors leading to 1,410ft² garden patio with large jacuzzi and seating area. The bedroom also has French doors accessible to the garden patio. 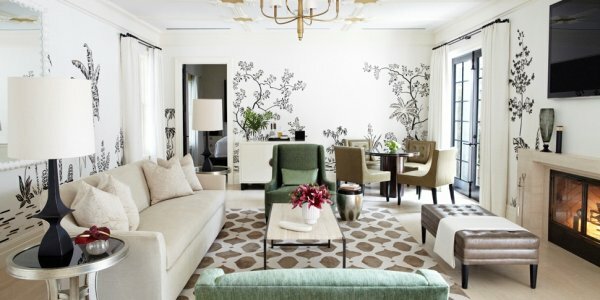 Inspired by Hollywood glamour, the Grace Kelly Suite is a shining star once again. Enter into an elegant living room with vaulted ceilings and a wall of floor to ceiling windows overlooking a gorgeous private patio, large jacuzzi and seating area. The Grace Kelly Suite has one of the most incredible 100 year old trees giving the patio an atmosphere like you’ve been transported to a forest. 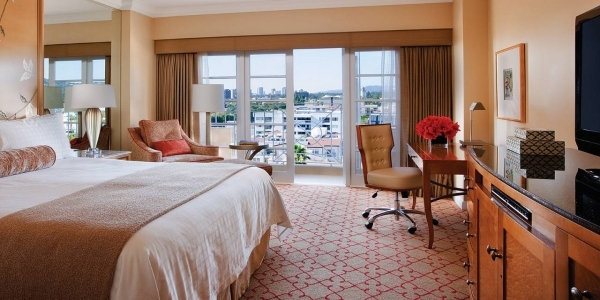 The Herb Garden Suite was designed with the history of Bel-Air in mind. This one-of-a-kind suite has it’s very own private elevator opening to a beautiful living room with gas fireplace, vaulted ceilings and French windows overlooking the gardens. The Chef’s kitchen with separate staff entrance is ideal when planning private parties and the dining room with seating for up to eight guests is the perfect location for an elegant evening dinner. The master bedroom is surrounded by French windows and leads to a private garden terrace, also accessible from the living room at the other end of the suite. With over 1,800ft² of living space and windows on all sides, this suite truly feels like a private home. The re-designed Chalon Suite is sure to get your attention. Located in the Lower Canyon this one-of-a-kind two bedroom, two and a half bath specialty suite will make you feel like you’ve returned to the Golden Era of Hollywood. Enter into the stunning great room revealing a wood burning fireplace with a set of French doors on each side leading to your private garden patio with seating area and jacuzzi. The master bedroom is accessible to the private patio as well through French doors. The second bedroom is on the opposite end of the suite and is a great kids room, nanny room, or guest bedroom with connected bath. The Stone Canyon Suite is located in the Upper Canyon in the former Presidential Suite. This incredible suite has over 2,837ft² of indoor/outdoor living areas to enjoy our glorious Southern California weather at its finest. The elegant great room features a wood burning fireplace and double french doors leading to the lush garden patio.The master bedroom is adjacent to the great room and also features double french doors leading to the 1,356ft² patio. The garden patio has a comfortable seating and dining area, gas fireplace for chilly nights, and large jacuzzi. The new Presidential Suite is one-of-a-kind masterpiece and feels like a private home. Enter through French doors from your own private courtyard to a spacious great room with vaulted ceilings, chef’s kitchen with staff entrance, dining for ten, grand piano, and a stunning monolithic wood burning fireplace. Both the bedroom and the great room are accessible to a lush 4,515ft² private courtyard with seating and dining areas and a 15’ x 22’ swimming pool.There is an additional 1,090ft² terrace with seating areas overlooking the gardens. Wolfgang Puck at Hotel Bel-Air features modern California with European and Mediterranean influences in a spectacular garden setting embracing the fabulous California lifestyle of indoor and outdoor living. All of our menus showcase the best of California’s wonderful, fresh ingredients such as produce from Chino Farms and local farmers’ markets, all natural poultry and sustainable seafood. The elegant dining room features large retractable glass walls revealing the beautiful gardens and terrace area and a large marble fireplace. The private dining room is located in a gorgeous glass wine cellar displaying 2400 bottles of wine. The new space features a marble fireplace and has been expanded to accommodate 14 guests with enough space to mingle before dinner. The Chef will personally cater to our guests with special treats and the famous Chef choice tasting menu will always be an option. For a more relaxed environment the beautiful terrace has the feel of a Spanish courtyard where guests can lounge in comfy booths, at the bar or in the ultra-private terrace alcoves overlooking Swan Lake. Each terrace alcove features curtains between them as well as an incredible seeded glass pendant light, a popular material used during the 1700s for lanterns and other types of glassware. Heated floors and a retractable screen covers the entire terrace for year round enjoyment. The famous hotel bar retains its unique club-like vibe from years past but with a glamorous twist. A central fireplace, grand piano and wood paneled walls will make you feel like you’ve been transported back to the Golden Age of Hollywood. Herringbone design floors, antique mirrors, and an incredible leather woven bar adds richness and depth to this chic new space. Since our Southern California weather is our greatest asset, the Bar has been expanded into the outdoors with the addition of three cozy garden alcoves separated by bi-fold doors. The doors can be open or closed depending on your mood. Our cocktails mirror the cuisine by utilizing the freshest ingredients of the season paired with high-end spirits with a focus on artisanal and small batch Bourbons, Ryes, Scotches and Japanese Whiskies. The cocktail menu, created by Executive Chef Lee Hefter offers approximately 20 hand-crafted drinks served in elegant crystal glassware from Bacaratt, Juliska, Reidel and Nachtmann. The new Lobby Lounge is the heart center of Hotel Bel-Air. The Lounge is a beautiful open space with Spanish colonial arched windows overlooking the gardens where you can relax and spend as little or as much time as you choose. The centerpiece of the Lobby Lounge is a spectacular hanging bronze fireplace with natural stone hearth, distressed hardwood floors, French Deco furnishings paired with eclectic contemporary chairs. With seating for up to 32 guests the lounge is perfect for tea, cocktails and conversation. Exclusively reserved for hotel guests only.